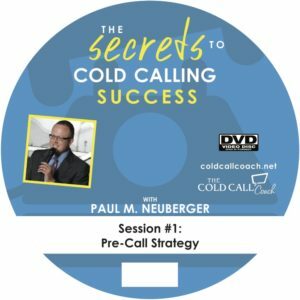 Hosted by Paul M. Neuberger, Founder & CEO of The Cold Call Coach, the Cold Calling for Success DVD is the only item like it in the marketplace and will provide you and your sales team with everything that you need to be more effective, efficient cold callers. Low cold call success rate? Suffer from call reluctance or phone phobia? Once you complete this innovative and game-changing training program, those will be things of the past! Did you know that cold calling is literally won or lost before you pick-up the phone? It’s true! Are you calling the right entity at the right time that has a right need for your services? 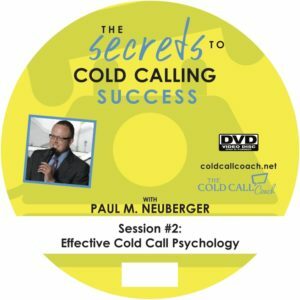 In this session, Neuberger will re-adjust your perspective on cold calling by discussing sound pre-call philosophies, Ideal Client identification, how to time the cold call perfectly, and much more! What good is an amazing script if you are calling the wrong person? What good is piquing curiosity and creating a profound sense of urgency if the organization that you are speaking with has no need for your services? Before we can get you in the door, we first need to ensure our ducks are in a row to optimize success. By psychology, we are not talking about brainwashing, nor are we advocating being deceptive, manipulative, or misleading. Far from it! Rather, we are talking about how your cold call is received by the prospect in question. Do you sound salesy? Have they made the determination in 3.5 seconds that you are only cold calling to sell them something? If so, you are doomed to fail before the call has even begun! In this session, Neuberger will share his best practices in Defensive, as well as Offensive, psychology. By Defensive, we mean how not to sound salesy and how not to self-incriminate during the call. By Offensive, we are referring to instant differentiation, piquing curiosity, creating urgency, elevating the mood of the prospect, and much, much more! Get the prospect to be happy that he/she took your call and watch your overall cold call success rate soar! Remember in English class how the teacher used to make you come to the board and diagram a sentence? Well, this is sort of the same thing! Rather than simply giving you a once-for-all-time cold call script, Neuberger will teach you how to build a cold call script from scratch so you will know exactly what to say to the Decision Maker and/or Person of Interest when he/she picks up the phone. Rather than give you a fish and feed you for the day, Neuberger will teach you to fish and feed you for a lifetime! If your Ideal Clients change, you will know how to modify your scripts. If you change careers, you will know how to modify your scripts. Because this process is portable, transferrable, and scalable, no matter where you go or who you call, you will know exactly how to build a customized message from scratch that will resonate with the Person of Interest. What happens if you get the voicemail for the Decision Maker? How do you handle a gatekeeper that wants to know everything about everything? What do you do if we get the Decision Maker, but she is peppering us with objections that could derail the entire call? In this final session, you will learn all that you need to ensure that you are prepared for everything that might be thrown at you. During our fourth session, Neuberger will call attention to all the things that could possibly derail your call, including objections, voicemails, gatekeepers, messages that don’t get returned, finding the correct Person of Interest, and much, much more! Don’t let everything you learned go to waste! Become an expert in cold call contingency planning and you will be ready for all situations you face moving forward. Once you complete the eight-hour Cold Calling for Success training program, you will have everything that you need to start burning up the phones: an effective pre-call strategy, how not to sound salesy, a world-class script, and the knowledge that you can overcome any obstacle that crosses your path. But before you get on the phones, wouldn’t you like to role play your script? Wouldn’t it be nice to run it past a world-renowned expert so issues can be addressed in advance to save you time and money? What about those questions you have that need answers? Most participants in this program will have questions and will want honest, direct feedback prior to working the phones. Who better to walk you through this than the creator of this program? For an extra fee, Neuberger will set aside one hour to review your scripts with you, role play, and make suggestions to ensure a positive ROI on your investment immediately. Ready to invest in yourself? Are you prepared to go to the next stage in your career and achieve the level of sales success that you have always wanted? Want to be someone that others admire for your remarkable sales achievements? Then place your order today and let’s get to work! Of course, should you have any questions, please know that we are at your humble service. You can contact us at 414-313-8338 or coldcallcoachllc@gmail.com. Ron Chandler, Vice President, Summit Investment Management.